Parent Company, the online toy retailer and, er, parent company of eToys and other stores, became the first notable holiday season retail casualty when it filed for Chapter 11 bankruptcy Monday. The company, which has had numerous ups and downs since the end of the dot-com boom, called the filing "unfortunate but necessary." Shoppers bring haggling skills to the mall, Boston.com/AP. Retailers are bending their own rules this season to secure sales. Asking for a better return policy, price match, or just a lower bottom line--all have become acceptable in the right situations. This is a stark shift from corporate policy, although for many consumers, it's not much different than simply waiting for an item to go on sale. Some interesting reading this weekend from two major newspapers. Barron's: Struggling to Survive at the Mall. Summarizes a lot of what we've been seeing this season, and reports on a wide range of brands and department stores. Since it's Barron's, each company comes with a stock price evaluation as well. New York Times: Handful of Niche Chains Stay Alive in Retailing. The teen market is doing better than most this season, particularly at Urban Outfitters, and other retailers (like Kohl's and Aeropostale) are well-positioned to weather the recession. KiS Golf, which operated indoor golf facilities in six states, converted from Chapter 11 to Chapter 7 bankruptcy this week and is liquidating assets. The shift in plans surprised many people, including irate customers with pricy membership plans. U.S. consumer prices dropped by a record 1.7% in November as the economy struggled with the immediate effects of the financial crisis. Economists keep a keen eye on prices; a steady decline creates deflation, which discourages consumer spending as people wait for prices to drop. This could have very real effects on the average shopper's in-store experiences, although this writer, who paid $1 for M&Ms from a newsstand yesterday, hasn't seen it yet. Industrial news, but two in one day four this week: Kongsberg Automotive is closing a plant in Ohio and Special Devices filed for bankruptcy. Special Devices, which makes a variety of technical components, cited the downturn in automobile sales; Kongsberg is restructuring. Update: there were more of these than previously noted. Auto supplier Precision Parts International, which makes metal componentry, filed for Chapter 11 bankruptcy and is planning liquidation; and plastic parts maker Key Plastics also filed for Chapter 11, but plans to reorganize. A moment of editorializing: if the market were able to signal for or against an auto industry bailout, these manufacturers are a sure sign in favor of one. The United States has hundreds of companies like the ones above who may fall in a real-world domino effect should America's car companies file for bankruptcy and wipe their credit slates clean. This author had not been in favor of industry aid, but posts like this give pause. Regional menswear chain S&K is closing 58 stores, 30 percent of total, and has put its headquarters up for sale as part of a restructuring plan. The company cited difficulties in the current retail economy as a major factor within a long-term initiative to cut costs. Hey, how about some good news? Forever 21 and Kohl's made a joint acquisition of 46 former Mervyn's stores. Fifteen of the locations will become Forever 21 stores and the other 31 will turn into Kohl's. Kohl's is maintaining its plan to open 50 new stores in 2009. Wholesale inventories fell a substantial 1.1 percent in October, the most since late 2001 following the September 11 attacks and dot-com slowdown. Sales by wholesalers dropped a record 4.1%. This points to lower production levels in 2009 and businesses trying to realign inventories to match lowered consumer spending. Regional auto rental company Advantage Rent A Car filed for Chapter 11 bankruptcy protection and is closing around 70 percent of its locations. The company, which once had 140 locations and 24,000 cars across 12 states, will be down to ten locations following the restructuting. Advantage is also drastically reducing staff at its headquarters. Toy retailer KB Toys filed for bankruptcy today, citing a "sudden and sharp decline" in sales. The liquidity crisis is specifically cited as a factor in the filing. The company, which has been around since the the 1920s, also went bankrupt in 2005. Update: as part of the filing KB is specifically planning on closing all its stores. The 58-year-old Baltimore Opera filed for Chapter 11 bankruptcy Monday and canceled its entire season. The opera, which has been struggling, also canceled contracts for three productions in next season's plans. The company faced a cash shortage and emergency financing guarantees in the weeks leading up to the bankruptcy filing. Office Depot announced it is closing 126 stores and six distribution centers to offset declining demand in the difficult economy. The retailer is halving its planned store openings for 2009 as well, from 40 to 20. Flooring product retailer iFloor filed for Chapter 11 bankruptcy and trimmed staff by 60 percent. The company, which operated 35 stores in addition to an ecommerce presence, fell short in fundraising efforts. iFloor is selling existing inventory and assessing whether the company can continue to operate. Women's clothing retailer B. Moss joined the list of Chapter 11 retailers with a filing Tuesday. The company, nearly 70 years old, has stores in 19 states. B. Moss hopes to begin going-out-of-business sales this weekend and close most of its 70 stores by the end of the year. A potential sale fell through earlier in the year. Barely a month after announcing its liquidation plan, Tweeter abruptly closed all its stores effective this morning. Employees were turned away and millions of dollars of unsold goods are now in lockdown. Many consumers may have lost merchandise and deposits in the swift action as well. 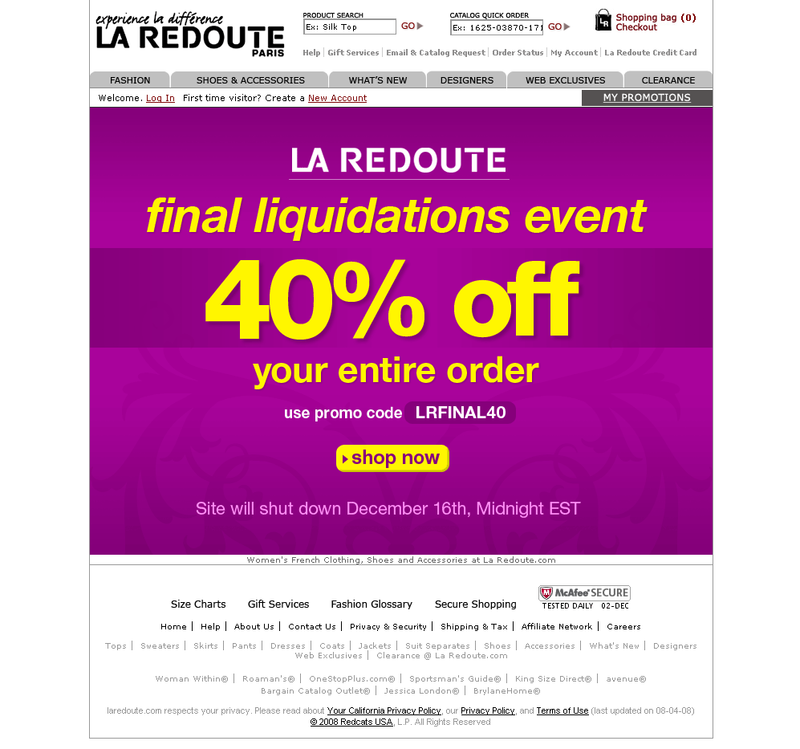 This one's interesting: La Redoute, a globally distributed women's clothing retailer, is closing its website December 16. The company operates a web-and-catalog business in the United States through Redcats USA. I'm unable to find news about the closing, but the site's home page indicates a final liquidation sale (see screenshot). Here's the "interesting": La Redoute on a corporate level is refocusing on its Internet business, with a restructuring plan that includes closing 81 outlets and ceasing its mail-order catalog. The company's online focus must not include the US market. Poultry producer Pilgrim's Pride filed for Chapter 11 bankruptcy today in a move widely expected by financial analysts. Pilgrim's Pride has suffered a double-whammy of increased costs (for feed) and reduced demand from restaurants, which has thrown off the company's supply curve. Pilgrim's Pride has already secured temporary financing and plans to continue operations while restructuring.